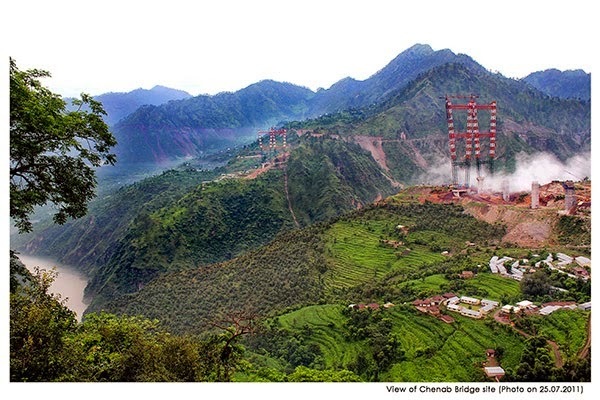 The proposed Chenab bridge on the Kashmir rail line, which was supposed to have the largest arch in the world and was to be an engineering marvel is now in serious trouble. An expert committee headed by E. Shridharan has criticized heavily, the entire alignment between Katra and Banihal and wants to opt for an alternate alignment. 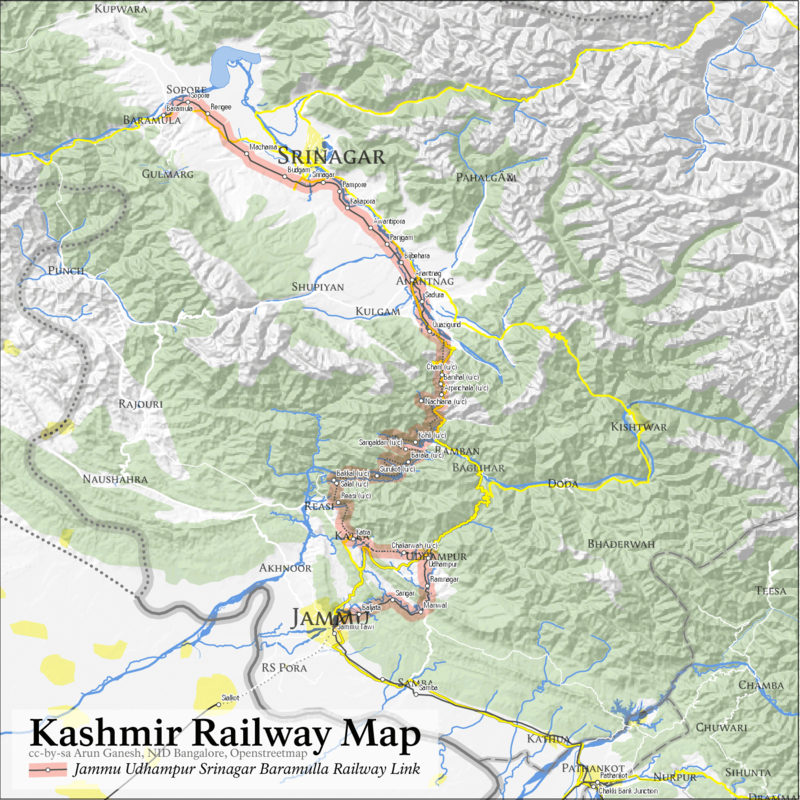 Indian Government took a decision in 1980's to link Jammu and Srinagar by railway and though work was started immediately, it proceeded at snail's pace. In the year 2002, it was declared a national project and only then the work got speeded up. The 119 Km railway link in Kashmir valley proper from Baramulla to Banihal was commissioned after many delays on 26 June 2013 only when 'Pir Panjal Railway tunnel' was completed. On the Jammu end of the railway line; even though the Jammu – Udhampur sector was completed in 2005 itself, a further extension up to Katra took another nine years to complete. Jammu to Katra line was opened to traffic only in 2014. The work on the Chenab bridge had started in 2002 itself and was awarded to “Konkan railway Corporation, a subsidiary of state-owned Indian railways. However, in the year 2008, the Ministry of Railways ordered cancellation of the project on then planned alignment between Katra and Banihal, due to suspected geological instabilities and for safety and feasibility concerns, including the area's strong winds. It instructed Konkan Railway to stop all work on the section, including the Chenab Bridge, and to terminate all contracts issued for work on the section, pending consideration of major changes in the alignment. A high-level committee was formed to examine the feasibility of this sector and to rework the alignment through the Pir Panjal Mountains, proposing to undertake a fresh survey for construction of the line on a shorter alignment. In June 2009, the panel recommended that 93 km out of the approved alignment of 126 km between Katra and Banihal be abandoned. It also raised questions about the safety of the Anji and Chenab bridges. The railway board accepted the report and, by August 2012, it scrapped the Anji bridge. The work on Chenab bridge, restarted in 2009 continues. The gorge of the Chenab river at this point is so deep that the bridge was expected to be 359 metres (1,177 feet) high above the river bed. It was to surpass the world's current tallest railway bridge over the Beipanjiang river in China's Guizhou province, which stands at 275 meters high and would also be 35 meter taller than the Eiffel tower in Paris. The 1315 meter long simple span bridge with 17 spans was to have a 469 meter long massive arch-shaped steel structure that would use up to 25,000 tonnes of steel. Weathering steel was planned to be used to provide an environment friendly appearance and eliminate the need to paint the bridge. The design of the bridge was such that it would withstand seismic activities and high wind speeds. The project also required 4,000 metric tonnes of reinforced steel, 46,000 cubic meters of concrete and eight million cubic meter excavation work. "If this bridge is damaged, its restoration will take a minimum of five to six years .As a result, the link to Kashmir Valley may remain disrupted for years together." The committee has endorsed an alternative alignment suggested by railways' chief engineer Alok Verma. 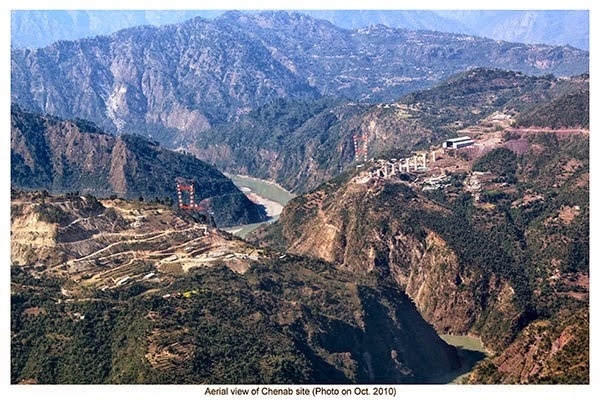 This alternate alignment of 70 Km, is shorter and straighter and cuts through the mountain ranges, shifting the location of the Chenab bridge from the gorge to the floor of the valley and thereby reducing its height from 359 metres to 120 metres. This new route folds at right angles or near right angles and is tucked deep into the mountains, away from dangerous slopes. E. Shridharan committee feels that the new alignment is the right solution and undoubtedly superior, though it has higher gradient, on considerations of constructability, stability, survivability, safety in train operations, quick and easy evacuation of passengers from tunnels, saving travel time, more capacity, etc. It further says in the report: " It is a practical and adoptable alignment, which could set the trend for similar railway projects being contemplated by the government in the Himalayan region and the new proposed line can be constructed faster and possibly at a lesser cost than what it would take for the balance works on the existing alignment to be completed". The committee is highly critical about the present management of the project by railway board and feels; " If the present pattern and style of implementation is followed, the project already delayed by eight years, would not be completed by any stretch of imagination in another eight years. If the government wants to complete the project early, the present system and style of construction management will have to be changed". It has recommended the execution of the new alignment be entrusted to a dedicated, fully government-owned company. The Chenab bridge, which was supposed to boast the largest arch in the world and was to be an engineering marvel, is now in serious trouble. Mr. E. Shridharan has such a formidable reputation regarding execution of railway projects, that no Government can really reject his opinion. The present design of the Chenab bridge is certainly doomed. It is only hoped that Government would take a quick decision in the matter and let Kashmir railway project gather full steam. Looks like the new proposed alignment will benefit E. Sreedharan the most, since his company specializes in tunnel construction.